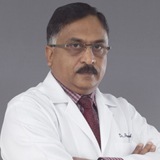 Dr. Pradeep Chand Nair, completed his MS in General surgery from Medical College of Baroda, and M.Ch in Thoracic and Cardiovascular surgery from Medical College of Trivandrum. He has several international publications, articles and scientific presentations to his credit. Dr. Pradeep has an impressive track record of over 18 years of performing varieties of Open heart, thoracic and vascular procedures. He has performed over 3000 Coronary artery Bypass surgeries. Dr. Pradeep has worked as consultant cardiothoracic surgeon in numerous hospitals of international repute. Dr. Pradeep practices the breadth of cardiothoracic surgeries, ranging from all kinds of valve surgeries, septal defects, Maze and Ross operations along with minimally invasive cardiac procedures for both valve and CABG surgeries. With a vast experience in cardiothoracic surgeries, his particular area of interest is in beating heart (off-pump) coronary artery bypass graft surgery with total arterial grafts. Dr. Pradeep can speak English, Hindi. Malayalam and Tamil and can understand Sinhala and Gujarathi.